Canadian astronaut David Saint-Jacques tests out the Bio-Monitor shirt in orbit during Expedition 58. The International Space Station wearable experiment is intended to monitor vital signs and transmit them to Earth, sending down information such as blood pressure and heartbeat measures. OTTAWA, Ontario — Fans of "Star Trek" know of the iconic tricorder that could take the measure of just about any vital sign for the spacefarers. Although astronauts on the International Space Station don't have access to this futuristic technology (yet), they are testing out devices like a shirt that measures heartbeat, temperature and blood pressure, according to an astronaut currently in orbit. Canadian astronaut David Saint-Jacques spoke with schoolchildren and media yesterday (Feb. 7) at the Canada Aviation and Space Museum via a brief downlink, answering questions such as how radiation affects spacefarers and how astronauts stay healthy in space. 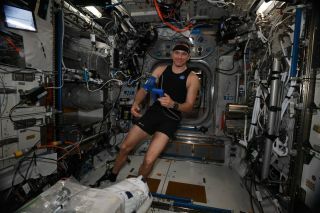 Microgravity is a nasty problem for astronauts, he explained while floating in the Japanese Kibo laboratory. Astronauts must spend roughly 2 hours a day exercising their cardiovascular and muscular systems to stave off weakness and damage. "We hope that [it] will become a very common product," Saint-Jacques told Space.com during a publicly broadcast question-and-answer session with media. And he didn't just mean in space. "It would be very useful for people who are deployed [in the military] … or people who are stuck at home, [where] it is difficult to go to the hospital. They could have their health checked remotely." Most of the other ISS medical equipment is "pretty conservative," although sometimes doctors get creative trying to use stuff that's already on the space station to monitor health problems, he added. Then, those creative solutions can get used back on Earth, too. "So we figured out a way in space, using an ultrasound machine, because that's what we had," he continued. Now, that's standard practice for many doctors. "Now, that's what we do on Earth to look for punctured lungs. We use an ultrasound machine." Former Canadian astronaut Robert Thirsk (top right) poses with schoolchildren at a new museum exhibit at the Canada Aviation and Space Museum in Ottawa on Feb. 7, 2019. The exhibit highlights the contributions of medical space technology to astronaut and consumer health. It also features astronaut doctors such as David Saint-Jacques. A flat picture of Saint-Jacques is displayed at top left. Saint-Jacques' call from space coincided with the opening of a new exhibit at the museum, "Health in Space: Daring to Explore." The traveling exhibit discusses several Canadian astronauts who journeyed to space. In addition, the attraction includes artifacts such as pictures of Saint-Jacques when he was a doctor working in Canada's north, a sample Bio-Monitor shirt and an example of the Microflow experiment on blood-sampling technology that flew with Canadian astronaut Chris Hadfield during his Expedition 34/35 mission in 2012-13. Retired Canadian astronaut Robert Thirsk attended the event and gave a quick tour of the exhibit to a small group of children, explaining how the artifacts on display were used in spaceflight. During the tour, he paused in front of an exhibit talking about how gravity affects astronauts. Canadian astronaut David Saint-Jacques (on screen) calls down from the International Space Station to a group of schoolchildren at the Canada Aviation and Space Museum in Ottawa on Feb. 7, 2019. The vision problem, which Thirsk played a role in discovering, still troubles NASA a decade later. What the agency knows for sure are the effects: Pressure on the back of the eye pushes the back end of the eye in and causes a change in the focal distance, affecting the astronaut's ability to read in space, among other things. No one knows exactly how the vision problems are happening, but NASA is investigating. One strong suspect is the lack of a day-night pressure cycle inside astronaut skulls when they're in space. Saint-Jacques' mission will examine a suite of Canadian medical technologies. These include Bio-Analyzer (which will do near-real-time blood analysis), MARROW (which will investigate whether microgravity causes fat accumulation in blood marrow) and MicroPrep (which samples body fluids to look for macromolecules such as DNA).